Rolo Sugar Cookie Cups are an easy dessert recipe using Betty Crocker Sugar Cookie Mix. These delicious cookies are baked in mini muffin tins and loaded with Skor bits, mini chocolate chips and Rolo chocolates. To make these cookie cups I started by dumping a package of sugar cookie mix into a large mixing bowl along with some softened butter and eggs. I used an electric mixer to combine the ingredients until no lumps remained. Then I added some mini chocolate chips and Skor bits to the bowl. I stirred them into the cookie dough using the electric mixer. Then I greased my mini muffin tins and scooped the cookie dough into the tins filling the cups about 3/4 of the way. I baked the cookie cups until they were starting to brown around the edges. 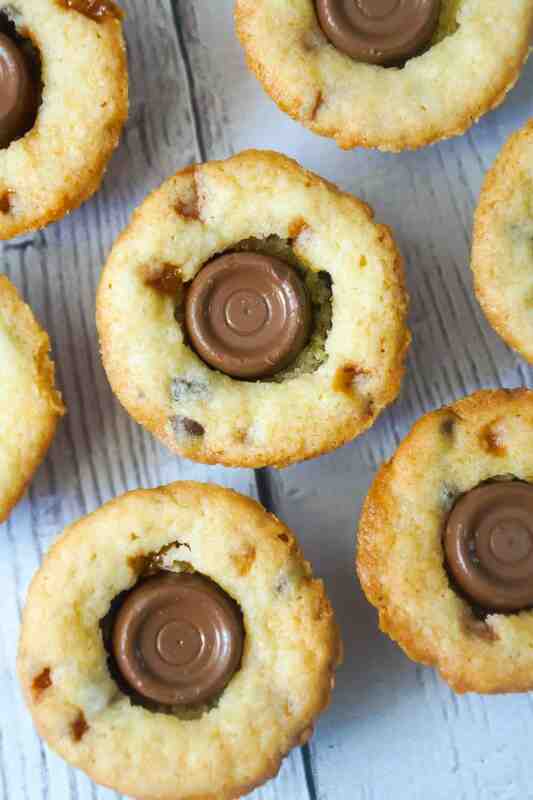 Then I placed one Rolo chocolate in the center of each cookie cup and pressed it down into the cookie. I allowed the cookie cups to cool for about five minutes before removing them from the muffin tins because if you try to remove them when they are still hot they will fall apart. Try these Rolo Sugar Cookie Cups if you are looking for a simple but impressive dessert recipe. 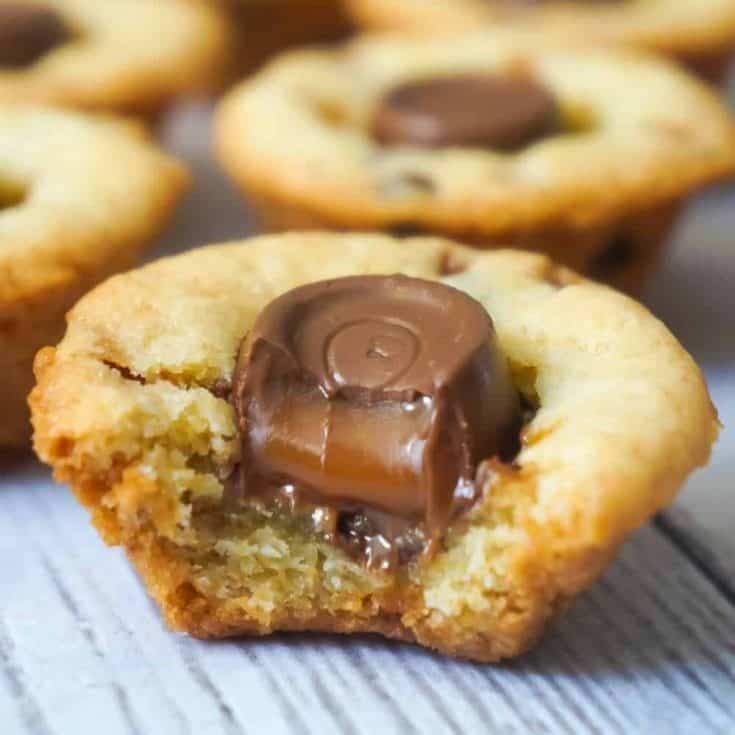 If you are looking for more cookie recipes check out Caramel Peanut Butter Cookie Cups, Peanut Butter Cookie S’mores Cups and Christmas Sugar Cookie Cups. 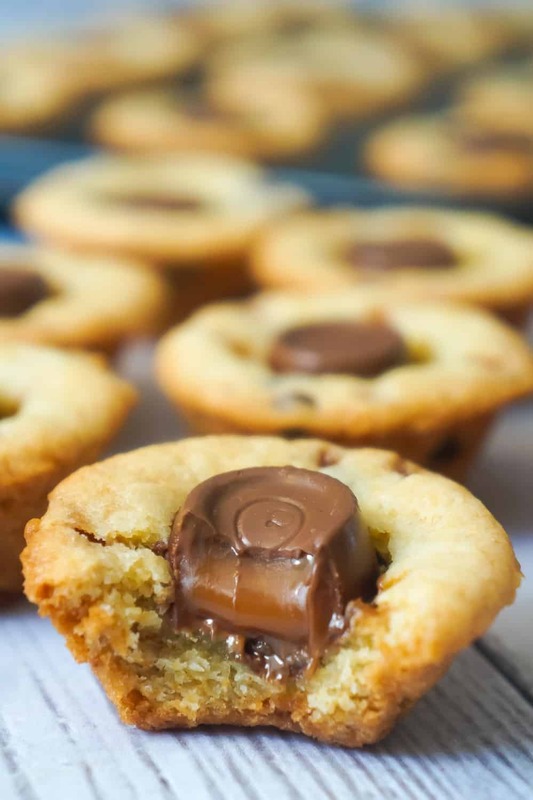 Rolo Sugar Cookie Cups are an easy dessert recipe using Betty Crocker Sugar Cookie Mix. 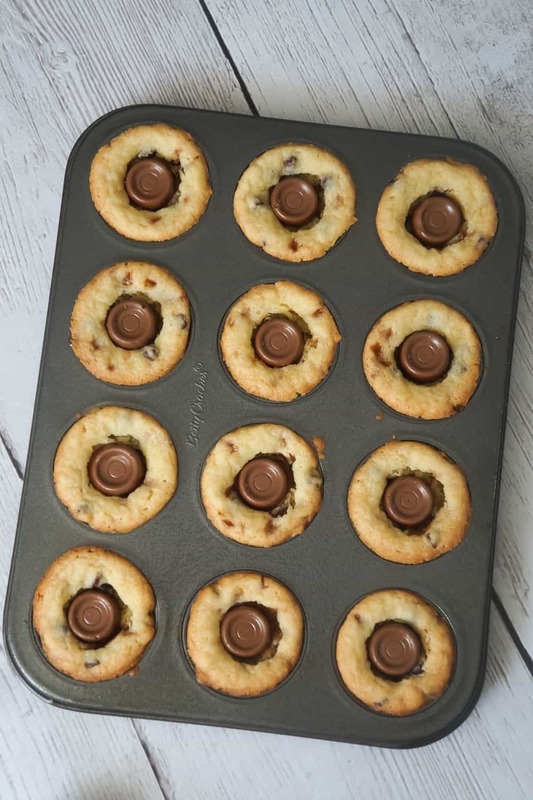 These delicious cookies are baked in mini muffin tins and loaded with Skor bits, mini chocolate chips and Rolo chocolates. 36 Rolo chewy caramels, approximately 7oz. 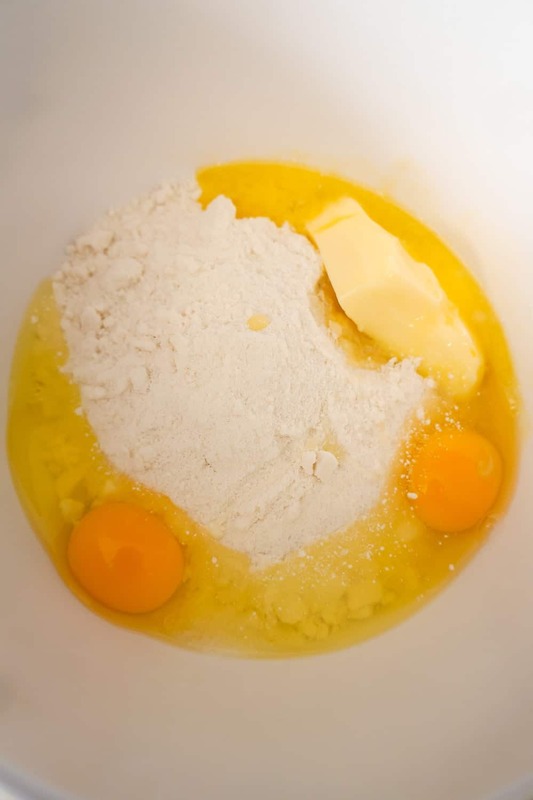 In a large mixing bowl combine sugar cookie mix, butter and eggs using an electric mixer. Mix until no lumps remain. 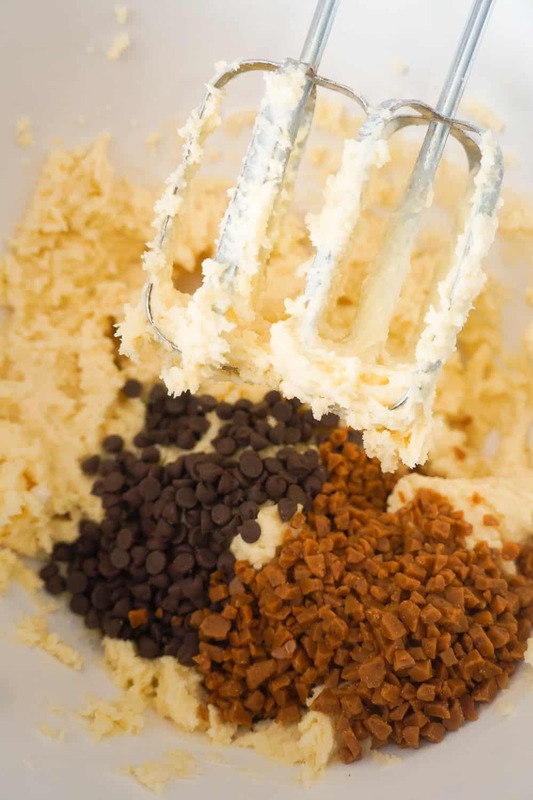 Add Skor bits and mini chocolate chips to the bowl and combine them with cookie dough using the electric mixer. 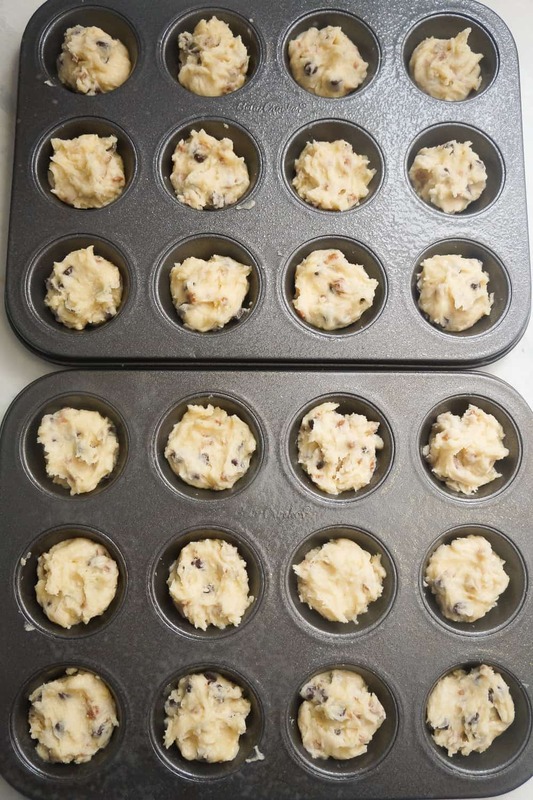 Grease mini muffin tins with non stick spray. Spoon cookie dough into muffin tins filling each cup about 3/4 of the way. Place in the oven and bake until cookie cups are browning around the edges. 10-12 minutes. Remove from oven and place one Rolo on each cookie pressing them down into the cups. 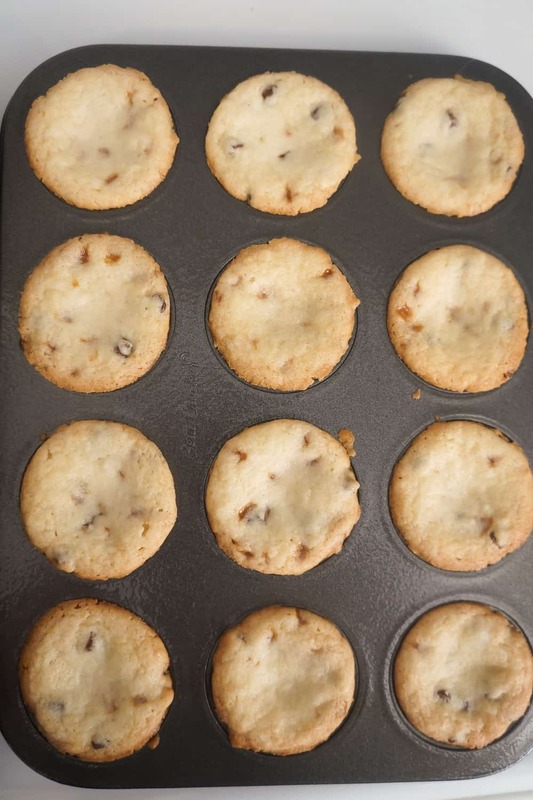 Allow the cookie cups to cool for 5-10 minutes before removing them from the muffin tins. They will fall apart if you try to remove them when they are still hot.